Not to be confused with OpenCL. Video games outsource real-time rendering calculations to the GPU over OpenGL. The rendered results are not sent back to main memory, but to the framebuffer of video memory instead. The display controller will then send this data to the display device. Open source license for use of the S.I. : This is a Free Software License B closely modeled on BSD, X, and Mozilla licenses. Trademark license for new licensees who want to use the OpenGL trademark and logo and claim conformance. Silicon Graphics Inc., (SGI) began developing OpenGL in 1991 and released it on June 30, 1992; applications use it extensively in the fields of computer-aided design (CAD), virtual reality, scientific visualization, information visualization, flight simulation, and video games. Since 2006 OpenGL has been managed by the non-profit technology consortium Khronos Group. In addition to being language-independent, OpenGL is also cross-platform. The specification says nothing on the subject of obtaining, and managing an OpenGL context, leaving this as a detail of the underlying windowing system. For the same reason, OpenGL is purely concerned with rendering, providing no APIs related to input, audio, or windowing. OpenGL is an evolving API. New versions of the OpenGL specifications are regularly released by the Khronos Group, each of which extends the API to support various new features. The details of each version are decided by consensus between the Group's members, including graphics card manufacturers, operating system designers, and general technology companies such as Mozilla and Google. In addition to the features required by the core API, graphics processing unit (GPU) vendors may provide additional functionality in the form of extensions. Extensions may introduce new functions and new constants, and may relax or remove restrictions on existing OpenGL functions. Vendors can use extensions to expose custom APIs without needing support from other vendors or the Khronos Group as a whole, which greatly increases the flexibility of OpenGL. All extensions are collected in, and defined by, the OpenGL Registry. The features introduced by each new version of OpenGL are typically formed from the combined features of several widely implemented extensions, especially extensions of type ARB or EXT. A book about X11 interfacing and OpenGL Utility Toolkit (GLUT). Essentially a hard-copy printout of the Unix manual (man) pages for OpenGL. The earliest versions of OpenGL were released with a companion library called the OpenGL Utility Library (GLU). It provided simple, useful features which were unlikely to be supported in contemporary hardware, such as tessellating, and generating mipmaps and primitive shapes. The GLU specification was last updated in 1998 and depends on OpenGL features which are now deprecated. Given that creating an OpenGL context is quite a complex process, and given that it varies between operating systems, automatic OpenGL context creation has become a common feature of several game-development and user-interface libraries, including SDL, Allegro, SFML, FLTK, and Qt. A few libraries have been designed solely to produce an OpenGL-capable window. The first such library was OpenGL Utility Toolkit (GLUT), later superseded by freeglut. GLFW is a newer alternative. These toolkits are designed to create and manage OpenGL windows, and manage input, but little beyond that. OpenGL Utility Toolkit (GLUT) – An old windowing handler, no longer maintained. 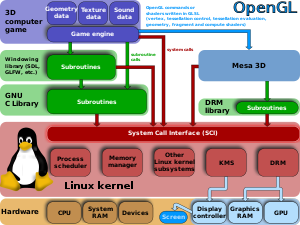 Mesa 3D is an open-source implementation of OpenGL. It can do pure software rendering, and it may also use hardware acceleration on BSD, Linux, and other platforms by taking advantage of the Direct Rendering Infrastructure. As of version 13.0, it implements version 4.5 of the OpenGL standard. By the early 1990s, Silicon Graphics (SGI) was a leader in 3D graphics for workstations. Their IRIS GL API was considered state-of-the-art and became the de facto industry standard, overshadowing the open standards-based PHIGS. This was because IRIS GL was considered easier to use, and because it supported immediate mode rendering. By contrast, PHIGS was considered difficult to use and outdated in functionality. SGI's competitors (including Sun Microsystems, Hewlett-Packard and IBM) were also able to bring to market 3D hardware supported by extensions made to the PHIGS standard, which pressured SGI to open source a version of IrisGL as a public standard called OpenGL. However, SGI had many customers for whom the change from IrisGL to OpenGL would demand significant investment. Moreover, IrisGL had API functions that were irrelevant to 3D graphics. For example, it included a windowing, keyboard and mouse API, in part because it was developed before the X Window System and Sun's NeWS. And, IrisGL libraries were unsuitable for opening due to licensing and patent issues[further explanation needed]. These factors required SGI to continue to support the advanced and proprietary Iris Inventor and Iris Performer programming APIs while market support for OpenGL matured. One of the restrictions of IrisGL was that it only provided access to features supported by the underlying hardware. If the graphics hardware did not support a feature natively, then the application could not use it. OpenGL overcame this problem by providing software implementations of features unsupported by hardware, allowing applications to use advanced graphics on relatively low-powered systems. OpenGL standardized access to hardware, pushed the development responsibility of hardware interface programs (device drivers) to hardware manufacturers, and delegated windowing functions to the underlying operating system. With so many different kinds of graphics hardware, getting them all to speak the same language in this way had a remarkable impact by giving software developers a higher level platform for 3D-software development. Microsoft released Direct3D in 1995, which eventually became the main competitor of OpenGL. Over 50 game developers signed an open letter to Microsoft, released on June 12, 1997, calling on the company to actively support Open GL. On December 17, 1997, Microsoft and SGI initiated the Fahrenheit project, which was a joint effort with the goal of unifying the OpenGL and Direct3D interfaces (and adding a scene-graph API too). In 1998, Hewlett-Packard joined the project. It initially showed some promise of bringing order to the world of interactive 3D computer graphics APIs, but on account of financial constraints at SGI, strategic reasons at Microsoft, and a general lack of industry support, it was abandoned in 1999. In July 2006, the OpenGL Architecture Review Board voted to transfer control of the OpenGL API standard to the Khronos Group. In June 2018, Apple deprecated OpenGL APIs on all of their platforms (iOS, macOS and tvOS), strongly encouraging developers to use their proprietary Metal API, which has been available for a few years. The first version of OpenGL, version 1.0, was released on June 30, 1992 by Mark Segal and Kurt Akeley. Since then, OpenGL has occasionally been extended by releasing a new version of the specification. Such releases define a baseline set of features which all conforming graphics cards must support, and against which new extensions can more easily be written. Each new version of OpenGL tends to incorporate several extensions which have widespread support among graphics-card vendors, although the details of those extensions may be changed. OpenGL 1.2.1 was a minor release, appearing only seven months after the release of version 1.2. It introduced the concept of ARB extensions, and defined the extension ARB_multitexture(in OpenGL 1.3 table), without yet incorporating it into the OpenGL core specification. ARB_texture_cube_map ARB Extension #7 Cube-mapped texturing. EXT_blend_minmax OpenGL Extension #37 also OpenGL ES Extension #65, Blending capability is extended by respecifying the entire blend equation. ARB_vertex_program ARB Extension #26 The first (commercially) vertex program for programmable graphics cards. OpenGL 2.0 was originally conceived by 3Dlabs to address concerns that OpenGL was stagnating and lacked a strong direction. 3Dlabs proposed a number of major additions to the standard. Most of these were, at the time, rejected by the ARB or otherwise never came to fruition in the form that 3Dlabs proposed. However, their proposal for a C-style shading language was eventually completed, resulting in the current formulation of the OpenGL Shading Language (GLSL or GLslang). Like the assembly-like shading languages it was replacing, it allowed replacing the fixed-function vertex and fragment pipe with shaders, though this time written in a C-like high-level language. The design of GLSL was notable for making relatively few concessions to the limits of the hardware then available. This hearkened back to the earlier tradition of OpenGL setting an ambitious, forward-looking target for 3D accelerators rather than merely tracking the state of currently available hardware. The final OpenGL 2.0 specification includes support for GLSL. ARB_pixel_buffer_object ARB Extension #42 Buffer objects may be used for asynchronous transfers of image data. Before the release of OpenGL 3.0, the new revision had the codename Longs Peak. At the time of its original announcement, Longs Peak was presented as the first major API revision in OpenGL's lifetime. It consisted of an overhaul to the way that OpenGL works, calling for fundamental changes to the API. The draft introduced a change to object management. The GL 2.1 object model was built upon the state-based design of OpenGL. That is, to modify an object or to use it, one needs to bind the object to the state system, then make modifications to the state or perform function calls that use the bound object. Under the Longs Peak API, object creation would become atomic, using templates to define the properties of an object which would be created with one function call. The object could then be used immediately across multiple threads. Objects would also be immutable; however, they could have their contents changed and updated. For example, a texture could change its image, but its size and format could not be changed. Among some developer groups this decision caused something of an uproar, with many developers professing that they would switch to DirectX in protest. Most complaints revolved around the lack of communication by Khronos to the development community and multiple features being discarded that were viewed favorably by many. Other frustrations included the requirement of DirectX 10 level hardware to use OpenGL 3.0 and the absence of geometry shaders and instanced rendering as core features. ARB_texture_float ARB Extension #41, ARB_color_buffer_float, EXT_packed_depth_stencil, ARB_framebuffer_object is required. This extension modifies EXT_depth_bounds_test and NV_copy_depth_to_color. ARB_half_float_vertex ARB Extension #48, Based on the NV_half_float and OES_vertex_half_float extensions. ARB_vertex_array_object ARB Extension #54, A new type of GL object, the "vertex array object", which stores a set of bindings to vertex arrays; this allows such arrays to be rebound with one function call rather than several calls to EnableVertexAttribArray, VertexAttribPointer, etc. NV_half_float Extension #283, This extension introduces a new storage format and data type for half-precision (16-bit) floating-point quantities. EXT_packed_float Extension #328, This extension adds a new 3-component floating-point texture format that fits within a single 32-bit word. NV_depth_buffer_float Extension #334, ARB_color_buffer_float is required. This extension provides new texture internal formats whose depth components are stored as 32-bit floating-point values. OpenGL 3.2 further built on the deprecation mechanisms introduced by OpenGL 3.0, by dividing the specification into a core profile and compatibility profile. Compatibility contexts include the previously-removed fixed-function APIs, equivalent to the ARB_compatibility extension released alongside OpenGL 3.1, while core contexts do not. OpenGL 3.2 also included an upgrade to GLSL version 1.50. OpenGL 3.3 was released alongside version 4.0. It was designed to target hardware able to support Direct3D 10. ARB_vertex_type_2_10_10_10_rev ARB Extension #86, trivially interacts with the OES_vertex_type_10_10_10_2 and interacts with the EXT_vertex_array_bgra extension. OpenGL 4.0 was released alongside version 3.3. It was designed for hardware able to support Direct3D 11. As in OpenGL 3.0, this version of OpenGL contains a high number of fairly inconsequential extensions, designed to thoroughly expose the abilities of Direct3D 11-class hardware. Only the most influential extensions are listed below. Hardware support: Nvidia GeForce 400 series and newer, AMD Radeon HD 5000 Series and newer (FP64 shaders implemented by emulation on some TeraScale GPUs), Intel HD Graphics in Intel Ivy Bridge processors and newer. Minimum "maximum texture size" is 16,384 × 16,384 for GPU's implementing this specification. Shader storage buffer objects, allowing shaders to read and write buffer objects like image load/store from 4.2, but through the language rather than function calls. Hardware support: Nvidia GeForce 400 series and newer, AMD Radeon HD 5000 Series and newer (FP64 shaders implemented by emulation on some TeraScale GPUs), Intel HD Graphics in Intel Broadwell processors and newer (Linux Mesa: Haswell and newer), Tegra K1. Direct State Access (DSA) – object accessors enable state to be queried and modified without binding objects to contexts, for increased application and middleware efficiency and flexibility. OpenGL ES 3.1 API and shader compatibility – to enable the easy development and execution of the latest OpenGL ES applications on desktop systems. Hardware support: Nvidia GeForce 400 series and newer, AMD Radeon HD 5000 Series and newer (FP64 shaders implemented by emulation on some TeraScale GPUs), Intel HD Graphics in Intel Broadwell processors and newer (Linux Mesa: Haswell and newer), Tegra K1, and Tegra X1. Hardware support: Nvidia GeForce 400 series and newer, Intel Haswell and newer, AMD Radeon HD 5000 Series and newer (FP64 shaders implemented by emulation on some TeraScale GPUs). Mesa on Linux mostly supports OpenGL 4.6 by Mesa 18.0 for Intel Haswell+, AMD Radeon GCN, Nvidia Kepler+ 9 of 11 ARBs, and intends to have full support in the 19.0 release in 2019. Mesa 18.2: 26 other ARBs with some candidates for OpenGL 4.7 about 75% developed and other 25% in development. AMD Adrenalin 18.4.1 Graphics Driver on Windows 7 SP1, 10 version 1803 (April 2018 update) for AMD Radeon™ HD 7700+, HD 8500+ and newer. Released April 2018. Vulkan, formerly named the "Next Generation OpenGL Initiative" (glNext), is a grounds-up redesign effort to unify OpenGL and OpenGL ES into one common API that will not be backwards compatible with existing OpenGL versions. The initial version of Vulkan API was released on February 16, 2016. Vulkan – low-overhead, cross-platform 2D and 3D graphics API, the "next generation OpenGL initiative"
^ "OpenGL 4.0 Specification" (PDF). Retrieved July 31, 2017. ^ "CS 370 → Labs". faculty.ycp.edu. ^ "SGI – OpenGL Overview". Archived from the original on October 31, 2004. Retrieved February 16, 2007. ^ Peddie, Jon (July 2012). "Who's the Fairest of Them All?". Computer Graphics World. Retrieved May 30, 2018. ^ a b c "Khronos OpenGL Registry". Khronos Group. Retrieved July 31, 2017. ^ "NV_half_float". OpenGL Registry. Khronos Group. ^ "How to Create Khronos API Extensions". Khronos Group. Retrieved July 31, 2017. ^ "A list of GLUT alternatives, maintained by". Khronos Group. Retrieved May 2, 2013. ^ "Related toolkits and APIs". www.opengl.org. OpenGL. Retrieved October 8, 2014. ^ "Creation of the OpenGL ARB". Archived from the original on February 22, 2007. Retrieved February 16, 2007. ^ "End of OpenGL++". Khronos Group. ^ "Top Game Developers Call on Microsoft to Actively Support OpenGL". Next Generation. No. 32. Imagine Media. August 1997. p. 17. ^ "Announcement of Fahrenheit". Archived from the original on September 27, 2007. ^ "Members of Fahrenheit. 1998". Computergram International. 1998. Archived from the original on October 5, 2007. ^ "OpenGL ARB to pass control of OpenGL specification to Khronos Group". Khronos press release. ^ "OpenGL ARB to Pass Control of OpenGL Specification to Khronos Group". AccessMyLibrary Archive. ^ Smith, Ryan (June 5, 2018). "Apple Deprecates OpenGL Across All OSes; Urges Developers to use Metal". www.anandtech.com. Purch. Retrieved June 5, 2018. ^ Astle, Dave (April 1, 2003). "Moving Beyond OpenGL 1.1 for Windows". gamedev.net. Retrieved November 15, 2007. ^ a b c "OpenGL 2.1 specification" (PDF). ^ "OpenGL 3.0 specification" (PDF). ^ "OpenGL 3.1 specification" (PDF). ^ "OpenGL 3.2 specification" (PDF). ^ "Khronos Unleashes Cutting-Edge, Cross-Platform Graphics Acceleration with OpenGL 4.0". ^ "Khronos Drives Evolution of Cross-Platform 3D Graphics with Release of OpenGL 4.1 Specification". ^ a b "Khronos Releases OpenGL 4.4 Specification". ^ Abi-Chahla, Fedy (September 16, 2008). "OpenGL 3 (3DLabs And The Evolution Of OpenGL)". Tom's Hardware. Retrieved October 24, 2010. ^ "The OpenGL Graphics System" (PDF) (Specification). 2.0. October 22, 2004. ^ "The Industry Standard for High Performance Graphics". OpenGL. August 18, 2008. Retrieved July 31, 2017. ^ a b c d "Intel Iris and HD Graphics Driver for Windows 7/8/8.1 64bit". Intel Download Center. Archived from the original on April 2, 2015. ^ "Expected maximum texture size - Graphics and GPU Programming". GameDev.net. ^ "Intel Skylake-S CPUs and 100-series Chipsets Detailed in Apparent Leak". NDTV Gadgets. April 17, 2015. ^ "Khronos Group Announces Key Advances in OpenGL Ecosystem – Khronos Group Press Release". The Khronos Group Inc. Retrieved April 17, 2015. ^ "OpenGL 4.5 released—with one of Direct3D's best features". Ars Technica. Retrieved April 17, 2015. ^ "SG4121: OpenGL Update for NVIDIA GPUs". Ustream. Archived from the original on May 17, 2015. Retrieved April 17, 2015. ^ Kilgard, Mark. "OpenGL 4.5 Update for NVIDIA GPUs". Retrieved April 17, 2015. ^ "Khronos Releases OpenGL 4.6 with SPIR-V Support". The Khronos Group Inc. Retrieved July 31, 2017. ^ "NVIDIA GeForce 397.31 Graphics Driver Released (OpenGL 4.6, Vulkan 1.1, RTX, CUDA 9.2) – Geeks3D". www.geeks3d.com. Retrieved May 10, 2018. ^ "AMD Adrenalin 18.4.1 Graphics Driver Released (OpenGL 4.6, Vulkan 1.1.70) – Geeks3D". www.geeks3d.com. Retrieved May 10, 2018. ^ "Radeon™ Software Adrenalin Edition 18.4.1 Release Notes". support.amd.com. Retrieved May 10, 2018. ^ Dingman, Hayden (March 3, 2015). "Meet Vulkan, the powerful, platform-agnostic gaming tech taking aim at DirectX 12". PC World. Retrieved March 3, 2015. ^ Bright, Peter (March 3, 2015). "Khronos unveils Vulkan: OpenGL built for modern systems". Ars Technica. Retrieved March 3, 2015. ^ "Khronos Announces Next Generation OpenGL Initiative". AnandTech. Retrieved August 20, 2014. ^ "OpenGL 4.5 released, next-gen OpenGL unveiled: Cross-platform Mantle killer, DX12 competitor". Retrieved August 20, 2014. ^ "Khronos Publishes Its Slides About OpenGL-Next". Phoronix. Retrieved August 22, 2014. Shreiner, Dave; Sellers, Graham; et al. (March 30, 2013). OpenGL Programming Guide: The Official Guide to Learning OpenGL. Version 4.3 (8th ed.). Addison-Wesley. ISBN 978-0-321-77303-6. Sellers, Graham; Wright, Richard S.; Haemel, Nicholas (July 31, 2013). OpenGL SuperBible: Comprehensive Tutorial and Reference (6th ed.). Addison-Wesley. ISBN 978-0-321-90294-8. Rost, Randi J. (July 30, 2009). OpenGL Shading Language (3rd ed.). Addison-Wesley. ISBN 978-0-321-63763-5. Lengyel, Eric. The OpenGL Extensions Guide. Charles River Media. ISBN 1-58450-294-0. OpenGL Architecture Review Board; Shreiner, Dave. OpenGL Reference Manual: The Official Reference Document to OpenGL. Version 1.4. Addison-Wesley. ISBN 0-321-17383-X. OpenGL Architecture Review Board; Shreiner, Dave; et al. OpenGL Programming Guide: The Official Guide to Learning OpenGL. Version 2 (5th ed.). Addison-Wesley. ISBN 0-321-33573-2. Wikimedia Commons has media related to OpenGL. Angel, Edward & Shreiner, Dave (2013). "An Introduction to OpenGL Programming". YouTube. SIGGRAPH University.